It took me a while to find just the right project. The one that said take me home, you know you want to. I perused thrift stores, my own house and even Goodwill a few times. Time was ticking by and I was starting to think I’d never find the right item. 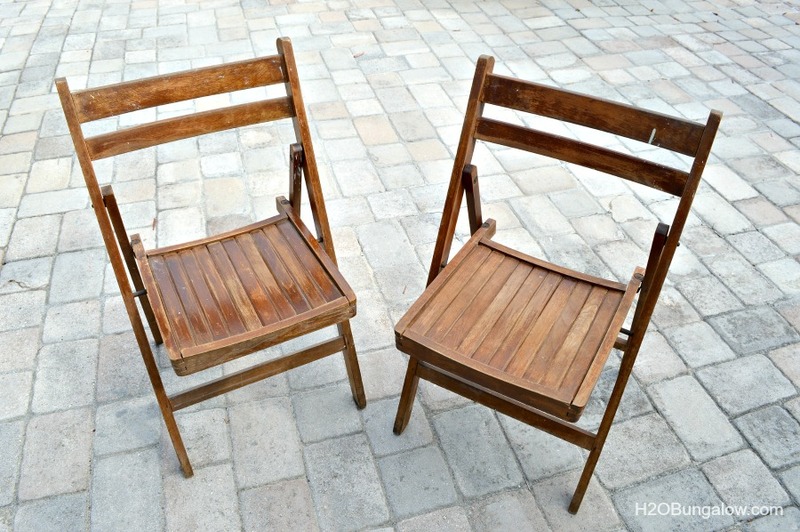 And then…I laid eyes on this set of vintage wooden folding chairs. I knew I had my project. 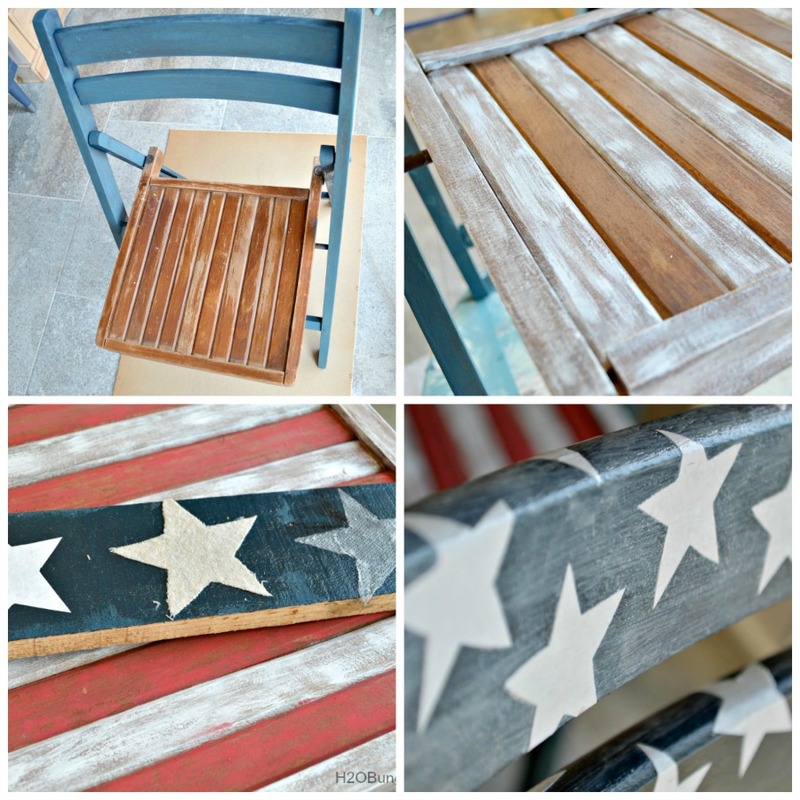 They spoke to me and when they did they said “we are perfect for red white and blue Americana Decoupage chairs”. I liked that this was a pretty simple project. I painted the frame a nice blue color. I thinned the blue paint down just a tad with water so the coverage looked a bit aged and worn. Using a dry brush technique, I dry brushed the white paint onto every other seat slat and the seat edge. Next I dry brushed the red paint onto the remaining seat slats. The Decoupage part was much easier than I expected it would be. I used a foam star as a guide and cut out several test stars in different materials. 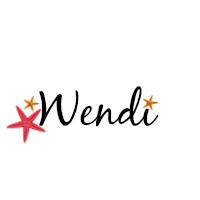 I wanted to wrap my stars around the curves of the wood backboard slats and I wanted clean edges on my stars. I tried drop cloth material, a very thin fabric liner and plain old white copy paper. The paper stars were the cleanest and hugged the edges of the chair back the best. I placed them randomly on the seat back and all the way around the two slats. Once I had them on, I gave the entire area a good topcoat of the decoupage stuff. I aged the stars by drybrushing the blue paint sparingly across them. The bright white of the copy paper needed to be toned down. Last, I sealed the entire chair with a matt sealer. 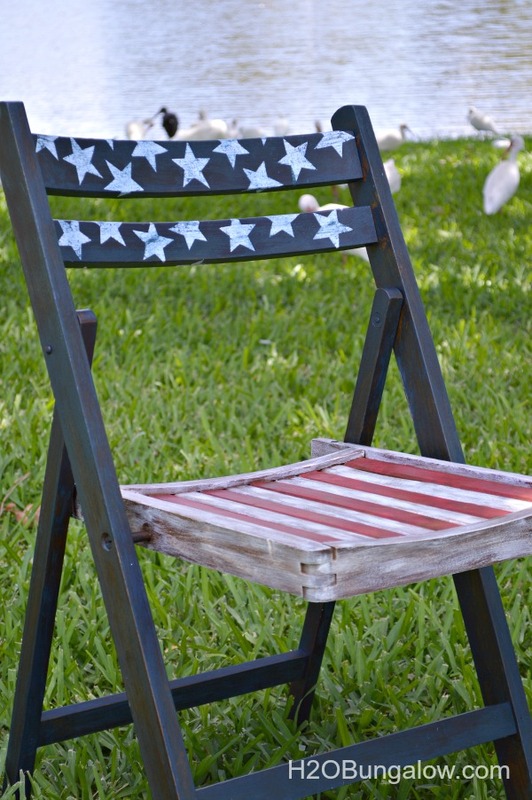 As I was working on my Americana Decoupage chairs, I started thinking about where they’d look good. I thought of days in the park, big old oak trees with Spanish moss hanging down, maybe a pavillion in the center and of course a lake with ducks in the background. Sounds like a nice place, doesn’t it? Our little park that has Friday night concerts was the perfect place. It’s a real location and close to my house. These chairs fit right in. In the fall Friday nights are packed here, everyone brings their own chairs and blankets. Usually a small cooler with a few snacks and a bottle of wine. There is a pavillion on the water’s edge where a different live band plays each week. Food trucks sell yummy treats like funnel cakes and lemonade in the back. Kids romp in the grass. But we don’t have ducks on our lake, we have ibis. Pronounced with a long “i” and “bis”. They have crazy looking long bills. Have I made you ready for a concert in the park sitting in Americana Decoupage chairs under a big old oak tree? Before you start getting too relaxed. let me share with you some amazing talent. 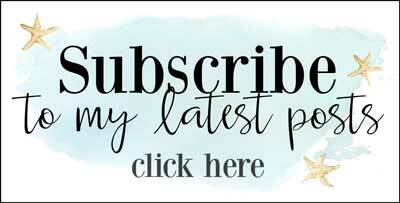 Below you’ll see a picture and a link to all the other talented gals in the Themed Furniture Tour Group and their Decoupage furniture project for this months theme. You did a awesome job on the chairs, they look Great! I bet you get lots of compliments on the chairs. Hi Linda and thank you! I do and wish I’d made a few more. I found these and scooped them up right away since someone else was looking at them the minute they were put on the floor at the thrift store! 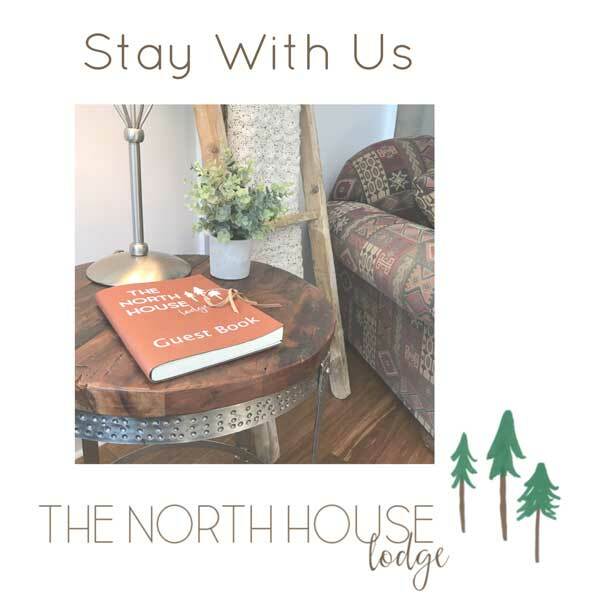 Thanks so much for taking your time to visit and leaving a sweet comment! I can’t tell you how much I want your chairs! I’m going to keep an eye out when thrifting for wood folding chairs. Thank you & I hope you find some. These were a steal at $5 each. I’m thinking of searching for more to make a set. Thanks so much for your visit and happy thrifting! Your chairs are so pretty! 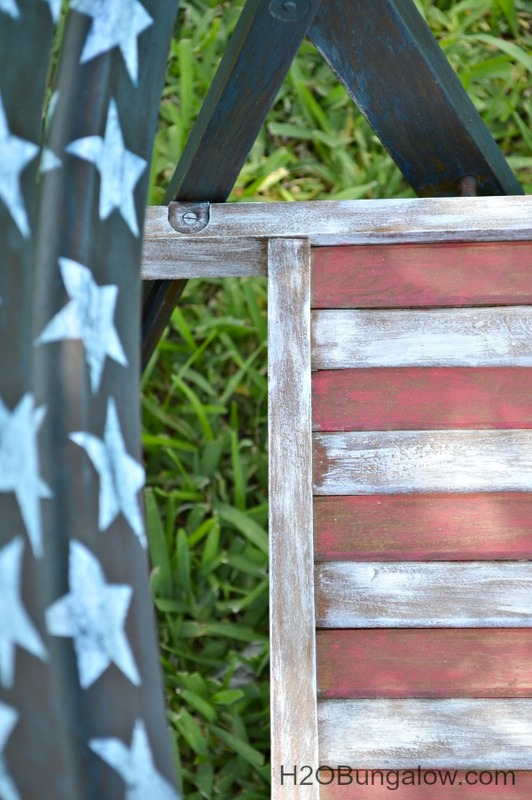 Love how you painted them and the decoupaged stars are perfect! I’ll be featuring this at Your Turn To Shine on Thursday. 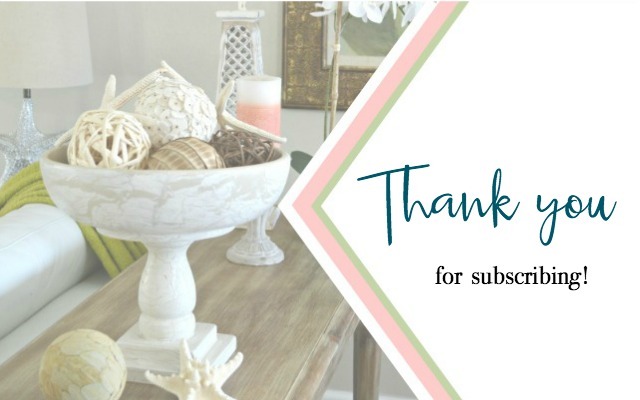 Thanks so much for linking up with us each week. 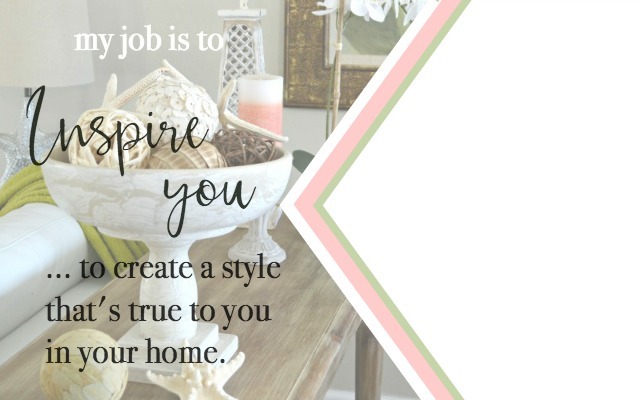 I always love seeing your projects, Wendi! Wow these look great! Thanks for linking up with #MummyMonday. Found this at Hit Me with Your Best Shot link party! 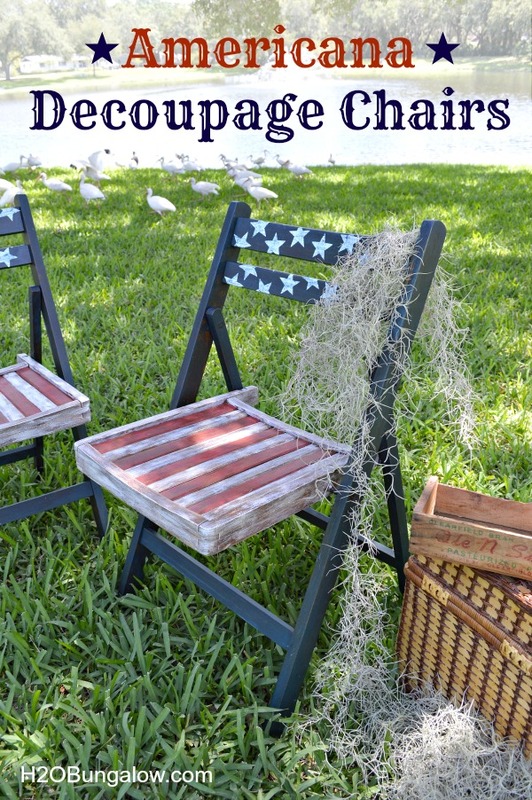 Great idea, and so perfect with the 4th coming up soon! Thanks you Ann! 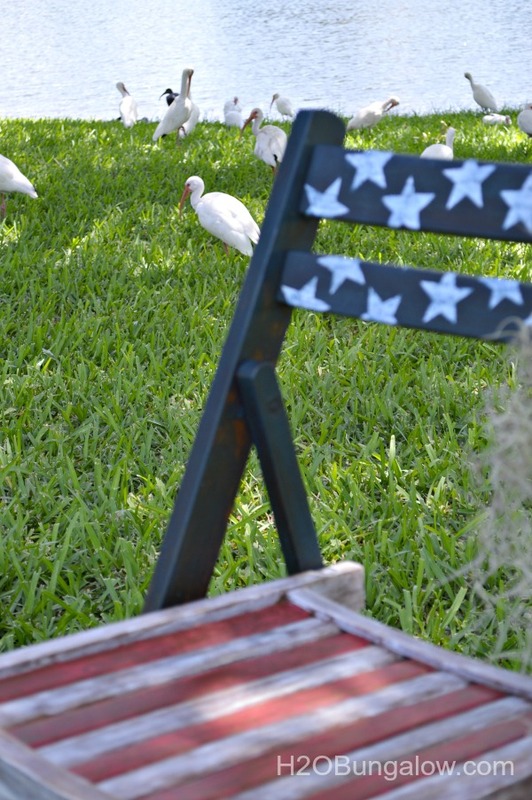 These chairs were so easy to makeover and fun to put out for patriotic holidays. Thanks so much for your visit! I love the makeover you gave these chairs Wendi, especially the dry brush paint technique. Pretty awesome job on your first decoupage project my friend. I bet these chairs will be great conversation starters at the concerts too. Yes, you’ve made me ready for the concert! Those chairs are the cutest! Very creative! 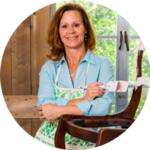 Wendi Wendi Wendi, your chairs are awesome! Love ’em and a fun Fall concert sounds like tons of fun! These chairs turned out so pretty Wendy! 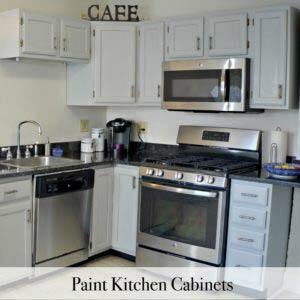 They have that perfect rustic aged look to them! Beautiful job! Love the chairs Wendi. Let me give you my shipping address, lol. I see you’re a fan of dry-brushing too. I like that you dry-brushed the stars. 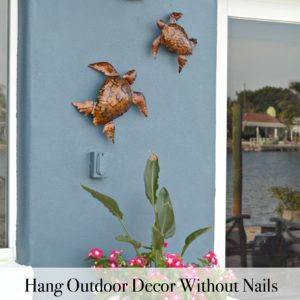 The perfect finishing touch! Kathy, When I was doing this, I was remembering a dresser you did with drybrushing and how much I loved the look…So I should thank YOU for the inspiration friend:) They are going to my shop..hopefully they don’t last long:) Thanks so much for your visit! How fun are these?! They turned out great, I love them! Too cute and so perfect for summer! Very nice Wendi! These chairs look great! I love how vintage they are. Thanks so much! I was thrilled when I found them! Wendi, Wow! I just love these chairs! Nice work! Wow, thank you Christy! I’m really happy my idea worked and looks good:) Thanks so much for your visit & I’m thrilled to be in the tour group with all of you!! 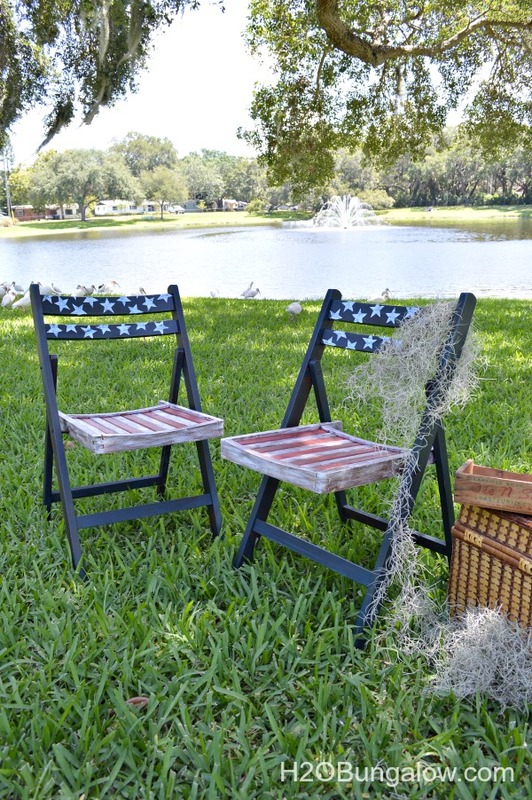 I love the patriotic look of your chairs and know that when you use them at Friday night concerts that you’ll get many compliments on them. Wendi, wow, wow, WOW! I love these chairs and you are definitely right that I just want to pull up a chair right now and relax! Great project! Wow..Tami That means a lot coming from you because I LOVE your work!! I had fun on this project. Especially because I was so intimidated by the theme..LOL Thanks so much for your super nice comment! Thanks Jeanette:) I thing the cut out stars were a good idea too. They really did a lot for the chairs. It’s been fun to be included with in the group and I’m loving all of the talent! Thanks so much for your visit. Wow, Vanessa! You just made my day. Thanks so much for all of your support…It is sooo appreciated friend! Thank you Debbie! I’m happy they turned out so well! It’s always nice when the the project ends up like it was planned:) Thanks so much for your visit! WEndy, I love the new look. They both look updated and refreshed. Ideal for your summer concert seats, huh? 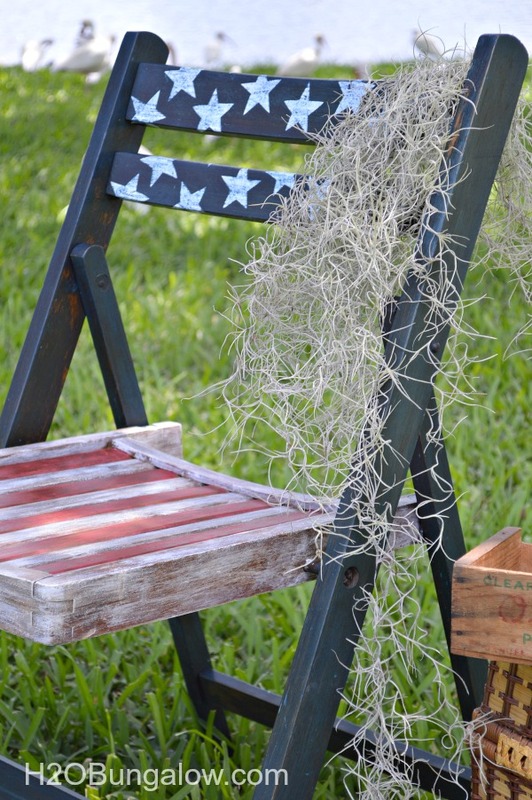 You can never go wrong with red, white and blue, can you? Gorgeous, Wendi! The chairs are beautiful and you did a fabulous job! I’m loving these cute chairs! Now I want to go on a picnic too. Thanks for the great idea! You did a great job! And these are perfect for Labor Day! Jamie, They are! They’d fit perfect in a small town out in the country too.. or in Tampa in a trendy little house which is where they’ll head after I bring them to my shop:) Thanks so much for your visit!